Ethnic Identity Construction among Muslim Prisoners in the USSR and Russia. The Russian Federation is second to the USA in its imprisonment rate among industrialized countries. According to the Russian Prison Service (FSIN) one-quarter of prisoners belong to one of the country's 158 official "non-Russian" nationalities. Despite this, there is a dearth of empirical research about the treatment of ethnic diversity in the prison system, today or in the past. Notwithstanding societal fears of terrorism, ethnic-organized crime and the growing confidence of right wing and extreme nationalist groups, FSIN has long insisted that ethnicity is "not an issue" in its penal institutions. Russia, we must understand, is a model of the multi-cultural prison and a consequence of the centuries-long nationalities policy, which subordinated ethnic difference to class. So deeply embedded in penal culture did the subordination of race, culture and religion to class become, so the argument goes, that ethnic-blindness was internalized by penal personnel and prisoners alike and continues to the present day. 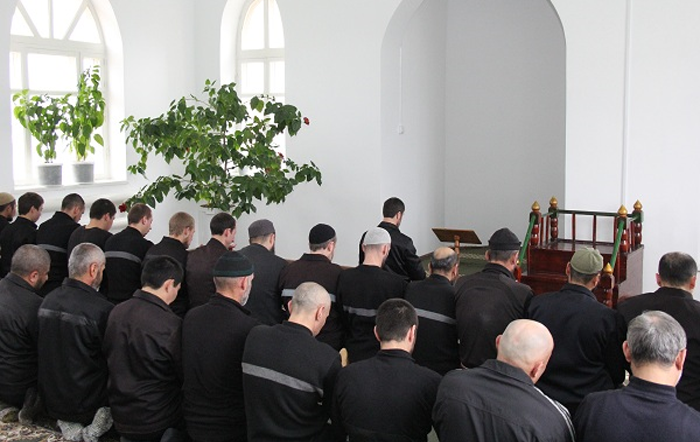 The two decades since the Chechen Wars, however, have seen these comfortable beliefs challenged, at least at the societal level, as prison has emerged in the popular psyche as a site of Islamic radicalisation. FSIN, meanwhile, has remained silent about the size of the Muslim population in its prisons and its policy towards prisoners sentenced for religious extremism and terrorism can only be inferred from the reports of human rights monitors. Somewhat belatedly, FSIN appears to be putting some effort into fulfilling its Council of Europe obligations to protect minority rights, including religious rights, in its prisons. In a move that might represent an attempt to combat Islamic radicalization it has employed preachers of traditional Islam and initiated training among prisoner officers in how to identify supporters of radical Islam. The project builds on previous UK research council-funded research on the Russian prison system, which resulted in numerous publications, media engagement and development of web resources. A proportion of the respondents interviewed for these research projects were drawn from ethnic minorities, although ethnicity was not the subject of these earlier investigations. Using funds awarded by the University of Oxford, Fell Fund, we ran pilot study to evaluate the feasibility of conducting interviews in the Russian Federation with Muslim ex-prisoners in Russia. In 2018, The Leverhulme Trust granted Professor Pallot an emeritus fellowship to write up and expand the pilot study. The aim of the project is to examine the argument about the ethnic- and racial-neutrality of Russia's prisons by examining the experiences of Muslim prisoners in the period from the mid-20th century to the present time. The project does not focus directly on the process of political radicalization, although the findings will be of relevance to the on-going debates about "prison jihad". The project will ask more fundamental questions about how the history, structure and ideology of the exceptional penal regime that there is in Russia can shape the ethnic, racial and religious consciousness of individuals drawn into it. To subject the imprisonment narratives of Muslim prisoners and their family members that surface in the interviews that have been already collected in the Fell Project to discourse analysis with a view to identifying the range of response of ethnic minority prisoners to the conditions that they encounter in Russian remand prisons and correctional colonies. To fill out the interviews and bring them up to date by mining current web-based social media postings and internet chat-room discussions about the experiences of Muslim prisoners. To publicise and disseminate research findings to the academic audience and policymakers through conference presentations and publications. The research will be brought to a wider audience through the radio and print media. The findings will be made available to potential beneficiaries through the network of contacts with prison reform NGOs in the Russian Federation and there will be a Russian research report produced for dissemination in the Russian Federation. Pallot, J. and Katz, E. (2017) Waiting at the prison gate: women, identity and the Russian penal system. I.B. Tauris and Co. Ltd. ISBN: 978-1-78453-660-2. Omel'chenko, E. and Pallot, J. (eds.) (2015) Okolo Tyurmy. zhenskie seti podderzhki zaklyuchennykh (Close-by Prison. Women's networks to support prisoners). Alteya. Pallot, J. and Piacentini, L. (2012) Gender, Geography and Punishment: The experience of women in carceral Russia. Oxford University Press, Oxford. pp. 330. ISBN: 978-0-19-965861-9. Piacentini, L., & Katz, E. (2018). The Virtual Reality of Imprisonment: The Impact of Social Media on Prisoner Agency and Prison Structure in Russian prisons. Oñati socio-legal series, 8(2), 183-204. Piacentini, L. and Katz, E. (2017) Carceral framing of human rights in Russian prisons. Punishment and Society, 19(2): 221-239. Pallot, J. (2015) The gulag as the crucible of Russia's 21st-century system of punishment. Kritika: Explorations in Russian and Eurasian History, 16(3): 619-648. Pallot, J. (2015) The topography of incarceration: the spatial continuity of penality and the legacy of the gulag in twentieth- and twenty-first century Russia. Laboratorium: Russian Review of Social Research, 7(1): 26-50. Katz, E. and Pallot, J. (2014) Prisoners' Wives in Post-Soviet Russia: 'For my Husband I am Pining!'. Europe-Asia Studies, 66(2): 204-224. Pallot, J. and Katz, E. (2014) The Management of Prisoners' Children in the Russian Federation. The Howard Journal of Criminal Justice, 53(3): 237-254. Piacentini, L. and Pallot, J. (2014) 'In Exile Imprisonment' in Russia. British Journal of Criminology, 54(1): 20-37. Moran, D., Pallot, J. and Piacentini, L. (2012) Rikoksen ja rangaistuksen maantiede Venäjän (Geography of Crime and Punishment in Russia). Idäntutkimus: The Finnish Review of East European Studies, 2012, 1: 3-24. Moran, D, J Pallot & L Piacentini (2013) Privacy in Penal Space: Women's Imprisonment in Russia. Geoforum 47, 138-146. Moran, D, L Piacentini & J Pallot (2013) 'Liminal transcarceral space: Prison Transportation for Women in the Russian Federation' in Moran, D, N Gill & D Conlon (Eds) Carceral Spaces: Mobility and Agency in Imprisonment and Migrant Detention. Ashgate, Farnham 109-126. Moran, D., Piacentini, L. and Pallot, J. (2012) Disciplined mobility and carceral geography: prisoner transport in Russia. Transactions of the Institute of British Geographers, 37(3): 446-460. Pallot, J. (2012) Changing symbolic and geographical boundaries between penal zones and rural communities in the Russian Federation. Journal of Rural Studies, 28(2): 118-129. Moran, D., Pallot, J. and Piacentini, L. (2011) The geography of crime and punishment in the Russian federation. Eurasian Geography and Economics, 52(1): 79-104. Katz, E. and Pallot, J. (2010) From femme normale to femme criminelle in Russia: against the past or towards the future? New Zealand Slavonic Journal, 44: 111-139. Nefedova, T.G., Treyvish, A. and Pallot, J. (2010) The "crisis" geography of contemporary Russia. Eurasian Geography and Economics, 51(2): 203-217. Pallot, J., Piacentini, L. and Moran, D. (2010) Patriotic discourses in Russia's penal peripheries: remembering the Mordovan gulag. Europe-Asia Studies, 62(1): 1-33. Moran, D., Pallot, J. and Piacentini, L. (2009) Lipstick, Lace and Longing: Constructions of femininity inside a Russian prison. Environment and Planning, D, 27(4): 700-720. Piacentini, L., Pallot, J. and Moran, D. (2009) Welcome to Malaya Rodina ('Little Homeland'): gender and penal order in a Russian penal colony. Social and Legal Studies, 18(4): 523-542. Pallot, J. (2007) 'Gde muzh, tam zhena' (where the husband is, so is the wife): Space and gender in post-Soviet patterns of penality. Environment and Planning A, 39(3): 570-589. Pallot, J. (2005) Russia's penal peripheries; Space, Place and Penalty in Soviet and post-Soviet Russia. Transactions of the Institute of British Geographers, 30: 98-112. Moran, D., Piacentini, L. and Pallot, J. (2013) Liminal transcarceral space: prisoner transportation for women in the Russian Federation. Chapter 8 in, Moran, D., Gill, N. and Conlon, D. (eds.) Carceral Spaces: Mobility and Agency in Imprisonment and Migrant Detention. Ashgate. pp. 109-126. ISBN: 9781409442684. Pallot, J. (2012) Sotsializm v ondom barake (Socialism in one barracks). Chapter 2 in, L. Omel'chenko (ed.) Do i Posle Tyurmy (Before and After Prison). St. P. Aleteia. Pallot, J. (2008) Continuities in penal Russia: Space and gender in post-Soviet geography of punishment. In, Luhausen, T. and P. Solomon (eds.) What is Soviet Now? Identities, Legacies, Memories. Lit Verlag. pp. 234-256.